The Louisiana Real Estate Salesperson Exam is split into two parts. The first part is the real estate salesperson national exam and the second part is the real estate salesperson state specific exam. 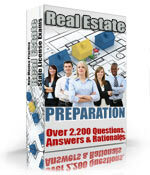 The national portion of the Louisiana Real Estate salesperson exam is comprised of 80 questions. In order to pass the exam an examinee must answer 56 out of the 80 questions correct to pass. The time limit allowed to complete the Real Estate Salesperson National Portion is 105 minutes. The state specific part of the Louisiana Real Estate Salesperson Exam is comprised of 55 questions and an examinee must answer 40 questions correct to pass. The time limit allowed for the state specific part of the Louisiana Real Estate Salesperson Exam is 75 minutes. Real Estate Salesperson Exams in Louisiana are administered by PSI exams at www.psiexams.com. Before registering with PSI for the Louisiana Real Estate Salesperson Exam you must first receive an eligibility notice from the Louisiana Real Estate Commission. You get this by submitting a Louisiana Real Estate Salesperson application, a proof of required education, and paying the salesperson application fee of $90. In Louisiana if you pass one part of the Real Estate Salesperson Exam you are permitted to take and pass a subsequent part at a later date. Keep in mind that there is a 90 day time limit in order retake one or both parts of the exam without having to submit another application and without having to pay another application fee. There is a 15 dollar retake fee that needs to be paid to the Louisiana Real Estate Commission in order to obtain a retake authorization before contacting PSI exams. The Louisiana real estate salesperson exams are taken by computer and you will receive your results immediately after finishing the exam. The exam is closed book. The fee to take the Louisiana real estate salesperson exam is 75 dollars whether you take one or both parts of the exam. The retake fee is also 75 dollars whether you take one or both parts of the exam.